Click here to see examples of drill press vises. One of the most common machine tools in the world today is the drill press. It is a tool found everywhere from professional machine shops to home garages to backyard sheds. While they range significantly in cost, power, size, precision, and features, their basic architecture is largely the same as is their main function, which is to drill accurate holes. Drilling accurate holes can be done whether you have a mini drill press, a bench top drill press, or a floor standing drill press. While you may go about this slightly differently depending on the nature of your machine, there is one common denominator: the drill press vise. The drill press vise is responsible for holding your work piece steady while you drill. Any sort of slip, vibration, or allowable movement when drilling will cause finished parts that are out of tolerance. If you are a professional machinist, this means lower yield and less profit. If you are a home hobbyist, this means more time spent machining. Now you may already know that there are a variety of options other than drill press vises for holding your work piece steady. However, these options tend to be less reliable as they are typically clamps and vise grip like devices that clamp your part directly to the table on your drill press. These have many disadvantages when compared to drill press vises so we tend to shy away from them in favor of recommending a high value drill press vise. So how do you choose the right vise for your setup? There are a number of features to consider when choosing the best drill press vise. Fortunately, we have provided a list of our recommended vises that we like best to make life easy for you. When it comes to choosing the best drill press vise, it’s easy to fall into the trap of becoming enamored with the cheapest ones. The odd thing is, there are tons and tons of cheapies on the market which is a tad strange considering how important good quality is when it comes to holding your work piece stationary. For the most part, the cheap drill press vises tend to flex or break when over stressed, which is quite easy to do considering the typical low yield strength of the materials in these vises. Fortunately, we won’t be recommending these, but we will be recommending some very high value vises! When it comes to our favorite all around drill press vise, it’s tough to top the Wilton 3-inch Cross Slide Drill Press Vise. 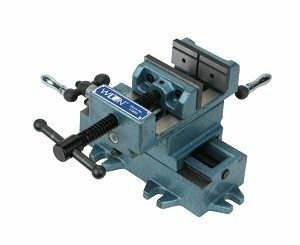 The first and most notable feature of this vise is that in addition to clamping your work piece, it also has two slides that allow you to move your clamped work piece in the X and Y directions. 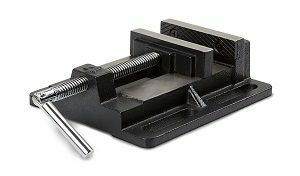 This is extremely handy when you want to make micro adjustments after clamping, which simply can’t be done with a more traditional drill press vise. The jaws are hardened steel and feature V-grooves, which allow you to position parts with rounded faces and hold them firmly. The material for the body of the vise is cast iron, which is finished in a nice blue-green powder coat. Actuation of the screw and each slide axis is smooth, without any noticeable grittiness. The screws and slides are exposed, so be aware that you will have to keep this vise clean to keep it operating at optimal performance. The mounting ears should allow you to mate the vise to pretty much any drill press table. The travel on the slides is just shy of 5 inches total travel for both the X and Y axes. This is plenty for any fine positioning work that you may need to perform. The jaw depth is 1.13″, which gives you a good amount of room. If you are working on particularly large parts, Wilton also offers this vise in larger sizes. Overall, Wilton’s cross slide vises are absolutely top notch, and the price is really attractive as well. We think you’ll be highly satisfied should you decide to pick one up as it will handle pretty much any abuse you throw at it and as an added bonus, it’s backed by Wilton’s lifetime warranty! Click here to see more pictures, read more reviews, and see prices. If you find that the Wilton above isn’t quite right for you or if you need a vise that’s more low profile, Tekton makes a terrific drill press vise that will treat you just as well. You will give up some features, but you will also pay significantly less for this vise as well. The only moving part on the Tekton drill press vise is the lead screw used to close the jaws, which means this vise is relatively low maintenance compared to vises with multiple slide axes. The jaws are hardened steel, as all good vise jaws should be, and they are also replaceable so you can swap in vise jaws made out of different materials or replace them when they are worn as necessary. The jaws are 4-inches, with an opening of 4.38″ and a depth of 1,06″. Build quality is decent, featuring 30000 psi tensile cast iron construction. Fit and finish are good, as evidenced by the high quality black powder coat finish. Mounting provisions allow you to mount this to a drill press table without any trouble. There is a lot of adjustability as the slots to mount the vise are quite generous lengthwise. Finally, the screw can be operated smoothly and with minimal effort, so no worries there. Overall, the Tekton drill press vise is a great value play, and while the price is inexpensive, this vise is much higher quality than what you’d expect at the price point. We think it will treat you well based on its simplicity and functionality and give it a solid recommendation. So there you have it, a quick breakdown of some of the best drill press vises on the market. While we have chosen our favorites, we know that there are many other great options out there. If you find that are suggestions aren’t quite the right fit for your application, feel free to click here to have a look at other drill press vises on the market.